When Kira Donovan has the opportunity to become a recruit for the Second Chance Institute during her senior year of high school in exchange for a full ride to college, she jumps at the chance, especially since all of her friends died in a tragic accident. However, she quickly learns that the SCI is nothing like she'd imagined: she finds herself on Earth's sister planet, Thera, where nothing is as it should be. The more she learns about Thera, the more Kira wonders what she's gotten into. It doesn't help that she's been paired up with the mysterious Blake Sundry as a partner, and on top of everything, she can't push Ethan, a stranger that she met at a party, out of her mind... all this adds up to a new young adult novel filled with action, romance, and suspense. Unfortunately, at this time, I was unable to find a video interview with Megan Thomason. However, a print interview can be found here. This book has such an interesting premise. Yes, it's dystopian, and as such, it has a lot of similarities with other dystopian novels - including a communist society that is highly regulated by the authorities. But the concept of a sister planet to Earth that is Earth's polar opposite, a planet where people who've died can have a second chance to live out their lives... that is a cool concept. The main problem with this book is that the super cool concept is not carried out as well as it might have been. We discussed many of its weaker points inclass and we agreed that one of its huge weaknesses is that Thomason throws a LOT of information at the reader in a very short amount of time. She'll have characters (usually Kira) asking questions about things that don't seem quite right, then wait about 50 pages and answer all of them at once. 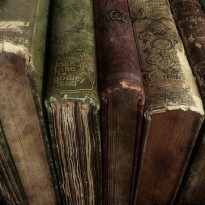 And then, the answers get repeated to us twice as each of the narrators get filled in on the information. I think a way that this problem could have been avoided would have been if Thomason had chosen to stick to one narrator. This book is told through multiple points of views - those of Kira, Blake, and Ethan (and in the very beginning, Bailey) - and in some books, this is a great way to keep the story moving and tell it from various perspectives. In this case, it created choppiness, led to repetition, and made the book much longer than it needed to be. I think it would have been better if Thomason had stuck to Kira's point of view - that way, we'd learn everything when the protagonist learned it and we wouldn't have to read the same information multiple times. 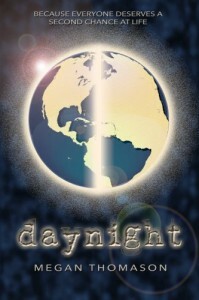 daynight shows some similarities to other recent young adult series. Although her story is certainly her own, there are common elements. For example, as in The Hunger Games, Thera is split up into various cities (similar to the districts in THG), each of which serves a different purpose for the overall functioning of Thera (example: Industrial City takes care of all of the manufacturing). I think the similarities to Twilight are more visible. There's a love triangle that exists throughout the entire book (and I suspect throughout the rest of the series as well) between Kira, Blake, and Ethan. Even the names are similar: Blake/Jake, Ethan/Edward. Blake is the nice but flawed boy, Ethan is the seemingly perfect in every way Prince Charming. They have sparkly eyes. Like in Twilight, the characters have crazy raging hormones but insist on not acting on them until they're Cleaved (aka married). Again, I don't mean to imply that Thomason stole elements of her story from these extremely successful YA series. But you can definitely see the similarities. Thomason was kind enough to respond to my initial review of the book and she pointed out that, contrary to what I had been told and despite the similarities, Twilight did not influence her when writing daynight. This brings me to my next point, and I'm not sure exactly how to word it. The characters, while not exactly one-dimensional, did not seem as fully developed as they could have been. To me, the boys didn't talk like boys - they talked like an adult woman's interpretation of teenage boys, but not like actual teenage boys. Everyone was overly sarcastic - yes, teens are sarcastic, but they do not respond sarcastically to each and every situation. Reactions to scenarios were far too calm. Example: The SCI shoots Kira's parents. Though horrified, she simply accepts this as her fault - if she had listened to the SCI's instructions to return to Thera, this never would have happened. Although it's possible that this could have happened had Kira experienced extreme trauma/brainwashing at the hands of the SCI before this point, at this stage, she really hadn't prior to this, and I didn't believe her mostly calm reaction. After reading my review, Thomason actually took the time to re-write this scene. I think it's remarkable that not only did she take the time to read my review AND respond to it, but she took my feedback seriously enough to modify her review based on what I had to say. I found the revised version to be a huge improvement, as Thomason added Kira's thought processes and mental responses to each thing that happened, rather than simply narrating the events. -There is NO WAY Blake could have climbed a bunch of ropes on the edge of a cliff at the age of three. -Blake could NOT have made it over the detonator when returning from the canyons and survived. On the off chance that he did, he would NOT have healed as promptly as he did. Ultimately, this book had a LOT of potential, but there were some key points that just had me shaking my head in disbelief/disappointment. I think that part of the problem is that (as far as I know), it's self-published. In her author's note, Thomason says that she's had several people look over her book and proofread it prior to publishing, but I think this really could have benefited from a professional editor, who could have given Thomason a bit more guidance as to format and style. She puts forth a good effort towards a potentially great book, but I don't believe that it's lived up to its full potential. I do think that this book will greatly appeal to teenage girls - if I were in middle school, I would have devoured it and bought it hook, line, and sinker. But as a college student reading it with a more critical eye, there is a lot of room for improvement, and I believe that many adults who give this a try will come to the same conclusions. I do intend to continue the series, however, because in spite of its flaws, it truly is an enjoyable story, full of plot twists and suspense. When Thomason spoke with me, she told me that although daynight was pretty much exclusively previewed by proof-readers, her later books in the series are being looked at by an editor and she does take beta readers and reviewers' feedback seriously. Considering my own experience with her, I definitely believe that. The revised scene that I had the privilege of reading makes me believe that her writing skills have definitely improved just in the short time since daynight was published and although, as stated, I think that daynight essentially reads as an early draft as a novel, I anticipate that her later works will be of a higher quality and will have benefited from her added experience. I look forward to reading the rest of the series and plan to look for the sequel once I've graduated. If I were to recommend this to anyone, I would definitely recommend it to middle school girls. There's really nothing too offensive or inappropriate for that age group and I think that preteen girls will appreciate the romance aspect of it, and, as stated, it bears similarities to Twilight and The Hunger Games that I think would appeal to that audience. Thomason told me that the book has also been very popular with college aged women, but based on my own experience and that of my classmates' I think I would be hesitant to recommend this to one of my own peers without being very familiar with their reading tastes. However, after I read the rest of the series, that might change and I might be more inclined to recommend this to a wider group of readers, with the caveat being that the series improves in later books.